An elegant, easy-to-turn shape showcases exceptional curly walnut grain. Make one, a pair, or more. 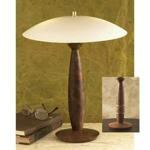 We provide a convenient source for the the figured wood and lamp parts, which are very affordable. As an added challenge, we will show you how to create a celtic knot which is optional on your lamp base. Wood and/or Supplies needed: We used walnut, figured walnut, and laminated hardwood. You can use wood of your choice.